Add Health findings have helped to identify major determinants of health and health behaviors during the transition from adolescence to early adulthood. The study followed its original nationally-representative cohort for more than 20 years. Add Health “combines longitudinal survey data on respondents’ social, economic, psychological and physical well-being with contextual data on the family, neighborhood, community, school, friendships, peer groups, and romantic relationships, providing unique opportunities to study how social environments and behaviors in adolescence are linked to health and achievement outcomes in young adulthood.” It has provided insights into the ways that families, schools, neighborhoods, and peers can influence positive health outcomes. This insight also led to better understanding of negative outcomes and behaviors, such as violent behavior, drinking, illegal drug use, smoking, and sexual behavior. A 1998 COSSA Congressional seminar, What Do We Know About Adolescent Health: Findings from the National Longitudinal Study of Adolescent Health, allowed the researchers to share some of the study’s initial findings with Congress. The study’s name was recently changed to the National Longitudinal Study of Adult Health. The researchers, along with two other teams of still-unnamed Golden Goose Award recipients, will be honored at the fifth Golden Goose Award Ceremony in September. COSSA is a sponsor of the awards. COSSA has submitted its annual Outside Witness Testimony to the House and Senate Appropriations Subcommittees on Commerce, Justice, Science, and Related Agencies (CJS). COSSA’s testimony for fiscal year (FY) 2017 addresses the need for strong funding of the National Science Foundation, Census Bureau, National Institute of Justice, and Bureau of Justice Statistics. Click here to read testimony submitted to the House, and here for the Senate. In addition to the requests for specific appropriations levels, a bipartisan letter in the House reaffirms support for the National Science Foundation’s “current practice of setting national scientific research priorities, investing in all disciplines of science, and using the merit review systems for determining which grant proposals to fund.” A letter in the Senate urges appropriators to include funding for the Centers for Disease Control and Prevention to conduct research on the causes and prevention of gun violence. The federal Interagency Committee on Human Nutrition Research (ICHNR) has released a five-year nutrition research plan, the National Nutrition Research Roadmap 2016-2021: Advancing Nutrition Research to Improve and Sustain Health. The Roadmap will help coordinate the nutrition research efforts funded by agencies across the federal government, as well as workforce development and training programs in support of nutrition research. The ICHNR is made up of representatives from agencies across the federal government, including the Economic Research Service (ERS) and National Institute of Food and Agriculture (NIFA) within the Department of Agriculture, the Centers for Disease Control and Prevention (CDC) and the National Institutes of Health (NIH) within the Department of Health and Human Services, the Department of Defense, NASA, the National Science Foundation (NSF) and the White House Office of Science and Technology Policy (OSTP), among others. The Roadmap lays out three major nutrition research priorities for federal research efforts, sub-topics within each priority, and where the federal agencies’ interests lie regarding each research question. The three overarching priorities for federal nutrition research are: (1) Understanding and defining eating patterns to improve and sustain health, (2) Helping people choose healthy eating patterns, and (3) Developing and engaging innovative methods and systems to accelerate discoveries in human nutrition. The National Science Foundation (NSF) recently announced the 2,000 winners of the annual Graduate Research Fellowship (GRF) program competition. Among the 2016 winners are 311 social and behavioral science researchers from across the U.S. The GRF program provides three years of financial support over a five-year fellowship period for graduate study that leads to a master’s or doctoral research degree in a STEM field, including social science. It is one of NSF’s flagship programs aimed at fostering the next generation of the STEM workforce and ensuring diversity within the workforce. The 2,000 awardees were chosen from about 17,000 total applications. The winners in the social and behavioral sciences come from the following disciplines and fields of study: psychology (136), archeology/anthropology (57), economics (31), sociology (30), political science (20), geography (14), linguistics (8), history/American studies (3), international relations (3), law and social science (2), communication (2), urban and regional planning (2), decision making/risk analysis (1), peace studies (1), and natural resources (1). The National Institute of Mental Health (NIMH) of the National Institutes of Health (NIH) is seeking input from stakeholders, the scientific community, and the general public related to its Research Domain Criteria (RDoC) framework. RDoC is defined as a “new way of classifying mental disorders based on dimensions of observable behavior and neurobiological measures.” Specifically, the Institute is seeking input regarding “existing tests with known construct validity, and also general suggestions on the most important criteria to consider when selecting candidate tests.” NIMH’s National Advisory Mental Health Council will convene a workgroup “charged with the task of recommending a list of valid and reliable tests for potential use for each construct.” To support the Council’s effort, the RDoC unit “seeks input and recommendations of tests with: (1) good construct validity as a measure of as a specific RDoC construct; (2) robust psychometrics; and (3) suitability for use across diverse participants.” The Institute is also seeking input regarding the “criteria that should be considered when selecting candidate tests.” Responses are due April 22, 2016. Why would a scientist put a shrimp on a treadmill? Can text messages really serve as a health intervention? You may have heard or read about some of these projects, but for the full story, come and speak to the scientists themselves. 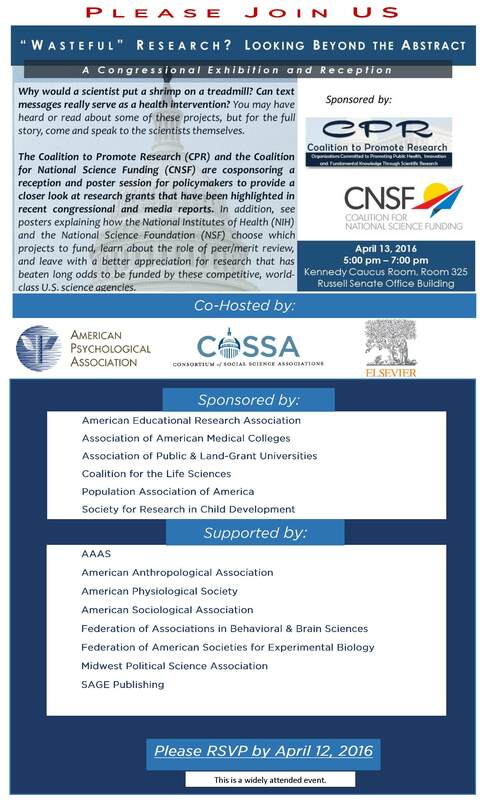 The COSSA-led Coalition to Promote Research (CPR) and the Coalition for National Science Funding (CNSF) are cosponsoring a reception and poster session for policymakers to provide a closer look at research grants that have been highlighted in recent congressional and media reports. In addition, see posters explaining how the National Institutes of Health (NIH) and the National Science Foundation (NSF) choose which projects to fund, learn about the role of peer/merit review, and leave with a better appreciation for research that has beaten long odds to be funded by these competitive, world-class U.S. science agencies. The event will take place on Wednesday, April 13, 2016, 5-7pm in the Kennedy Caucus Room of the Russell Senate Office Building. Click here for more information, and here to RSVP. The event is co-hosted by the American Psychological Association, Consortium of Social Science Associations, and Elsevier. Sponsors include the American Educational Research Association, Association of American Medical Colleges, Association of Public & Land-grant Universities, Coalition for the Life Sciences, Population Association of America, and Society for Research in Child Development. 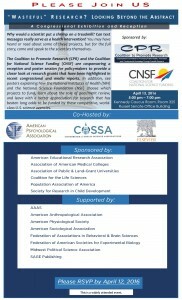 Supporters of the event include AAAS, American Anthropological Association, American Physiological Society, American Sociological Association, Federation of Associations in Behavioral & Brain Sciences, Federation of American Societies for Experimental Biology, Midwest Political Science Association, and SAGE Publishing.